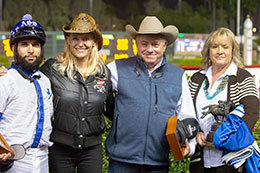 Vanessa Bartoo's Corona Ranger winning the Grade 3 $150,000 Adequan Derby Challenge Championship on Saturday. 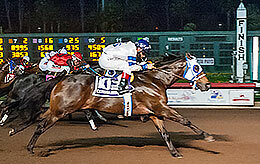 LOS ALAMITOS, CA—NOVEMBER 17, 2018—Corona Ranger sprinted to a half-length victory in Saturday's $150,000 Adequan Derby Challenge Championship (G1) at Los Alamitos. Corona Ranger was stretching out in distance off of his third-place finish in a 330-yard, $13,100 allowance dash at Los Alamitos on October 28, his first-ever out at the track. The gelding was bred in Oklahoma by Bollenbach Farms, and he was a $40,000 purchase at the 2016 Ruidoso Select Yearling Sale. He is out of the Azoom mare Azoom Babe.